Project Marketing in Lebanon – Caves are important! Brighftox has customers around the world so we often see different methods of marketing new projects which are geographically specific. 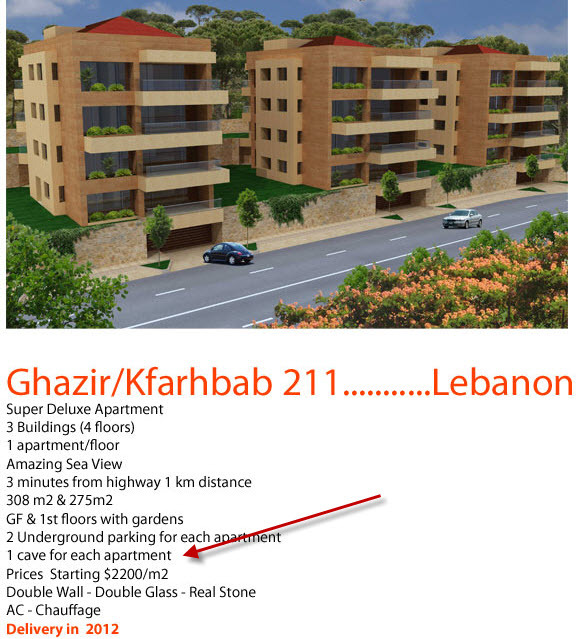 This morning I received the below email promoting a luxury project in Lebanon. Quite large floor plates, see views and all in all pretty good sounding apartments. Then I saw the most important inclusion of all – 1 cave for each apartment! I can only assume that this is a bunker and that in itself is a reminder of life in Lebanon and the ever-present security risks of the region. Nevertheless, it is amusing to read it in an advertisement.